Viral pharyngitis can be quite uncomfortable, but also leave severe consequences. Discover the symptoms and treat it on time with homemade remedies. The symptoms of viral pharyngitis can be diverse, from inflammation of the tonsils, difficult swallowing to fever. Therefore, it is ideal that you know how to treat this condition with some natural remedies. The symptoms of pharyngitis range from fever and sore throat to malaise and general pain. It is caused by bacteria so its main treatment is through the use of antibiotics that the doctor will prescribe. Bacterial agents such as Streptococcus pyogenes and Haemophilus influenzae have a lot to do with the appearance of pharyngitis. Rare names, right? More simply, the cause of pharyngitis is the inflammation of the mucosa that covers the pharynx when it comes in contact with some viruses. Although the visit to the doctor is necessary, it is also useful that you know how to improve the symptoms using some natural remedies. 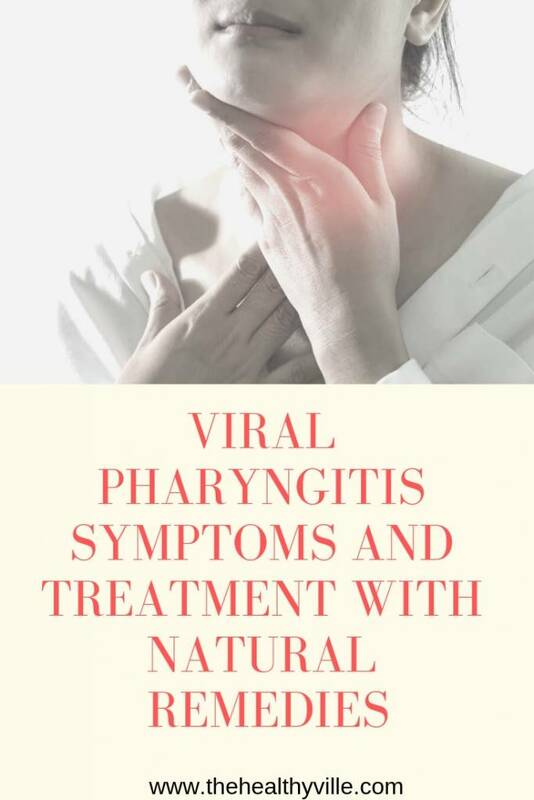 Some natural remedies can help us to calm the symptoms of viral pharyngitis. Pharyngitis is inflammation of the pharynx mucosa that often causes pain to swallow. The pharynx, commonly known as the throat, is the cavity that extends from the back of the nose and mouth to the beginning of the larynx and esophagus. Many times by constantly consuming certain types of drugs over time we generate resistance or tolerance to their compounds and these stop working in our body. For this reason, we have thought of 5 remedies of natural origin with which they can alleviate the symptoms of pharyngitis quickly. The bicarbonate has antiseptic and soothing properties, ideal to treat inflammation in the tonsils or throat. What you should do is pour a spoonful of this compound into a bottle and shake it well. Gargle for 1 minute, spit and repeat the process. Further info: 10 Benefits Of Baking Soda In Water – Miracles Can Happen! Possibly the best natural combination to fight colds or infections are lemon and honey. This remedy is perfect to disinfect and slightly reduce inflammation of the affected area. In addition, honey works as a powerful expectorant, so it is recommended to eliminate dry cough and phlegm, as well as other types of respiratory conditions. In a cup, squeeze 2 lemons and add 1 tablespoon of honey. Take it in the morning, but especially at night so you have a good rest. If the taste is a bit strong, add a little water. Among the symptoms of pharyngitis is the difficulty in swallowing solid foods. One of the most well-known symptoms of pharyngitis is swallowing that is difficult, that is, not being able to swallow or having difficulty swallowing solid foods. For this reason, we recommend that you follow a soft diet, and with this we refer to soups, juices, smoothies and creams. Vegetable creams are excellent to keep you fed and at the same time make it easy to swallow. If you have a fever, we recommend you stay hydrated with soups or chicken broth. Of course, go to the doctor if you consider that the temperature is too high. The cold shakes relieve a little irritation and itching, but try to make them fruit, especially citrus because they contain vitamin C.
Cranberries contain anti-inflammatory properties that help improve swallowing of food when you have pharyngitis. You can prepare porridge, juice or smoothies with 1 or 2 cups of blueberries and a little water. Try not to use sugar, if you know very simple use some honey or stevia. Apple cider vinegar is a good option for those who cannot stand the taste of traditional vinegar. Although it seems unpleasant, the vinegar is antiseptic and antibacterial, so it is very effective in curing the infection of the tonsils, especially when there is pus in the area. You will only have to take a glass of water and pour 4 tablespoons of vinegar into it. Next, gargle for half a minute and spit. This is one of the most effective remedies to eliminate the infection in the tonsils. When there is presence of pus, special care and attention must be taken, because this means that the infection has spread. Wet a cotton swab with a little hydrogen peroxide. Proceed to clean the area with pus, taking great care not to hurt yourself and not cause arches. When you remove the largest amount of pus plate, stop the process. Repeat as many times as necessary until you feel that pus is no longer forming. Additional info: Believe it or not, you can even eliminate excessive plaque on teeth and tartar using baking soda and hydrogen peroxide. There’s another interesting use of hydrogen peroxide! Take a glass of warm water and pour a spoonful of salt into it. Mix well so that the salt is diluted and proceed to gargle for 1 minute. Then, spit and repeat the process about two more times. Don’t forget to SHARE the symptoms of viral pharyngitis and its treatment with your friends and family on your social networks.